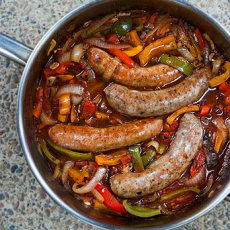 Place sausage in slow cooker. Stir in garlic, pepper stir-fry, pepper rings, pasta sauce, tomato paste and pepper. Cover, set heat to low and simmer 8-10 hours. This entry was posted in Chicken, Entrees, Modified Profast (Fast and Flexible) Recipes, Nutriplus Recipes (Balance Your Pyramid), Slow Cooker, Vegetables and tagged banana peppers, one dish, one pot meals, onions, peppers, sausage, slow cooker, turkey by foodies4mmc. Bookmark the permalink.